It was devoured in record time; I didn’t even have the chance to take pics of a slice! Full house to empty nest in the space of forty-eight hours. It was a whirlwind visit from my Angel Boy; more like a pit stop, really. The summer class he was teaching at Yale was over. We picked him up from the airport Monday afternoon and he flew away Wednesday afternoon. Except for the hours he was sleeping or surfing, my son’s number one activity was EATING. That child of mine always had a wonderful appetite, but this was Olympic-level eating. I was a whirling dervish of a baker: Apple Pie, French Bread, Blueberry Banana Bread, Chard and Mushroom Lasagna plus his favorite Cake Roll. Sometimes I fill it with ice cream, but summer berries looked so beautiful at the farmer’s market so that’s what I did. I bet he gained at least three pounds. I’ve posted the recipe I always use from my mom’s 1940’s Betty Crocker cookbook. 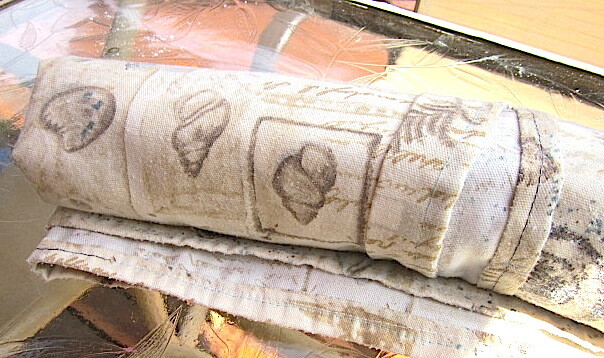 Here’s a pictorial about how to create the roll. I did it outside on our deck because it’s kind of messy with the powdered sugar but if you don’t use it, the cake sticks to the cloth. This is how it should look, barely browned and still spongy. You can cut off the edges if they’re crispy. Carefully turn it over onto a powdered sugar-covered cloth and peel away the parchment paper without destroying the cake (easier said than done!) 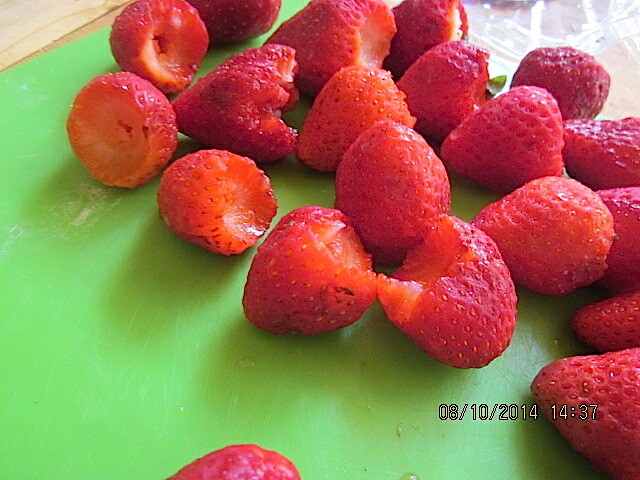 Roll it all up like a giant sushi roll and put in the freezer to cool off while you slice the gorgeous strawberries. Add only enough sugar to macerate (get juicy.) There is no excuse NOT to whip fresh cream. Nothing out of a can, thank you very much! It only takes a few minutes and it’s so yummy. 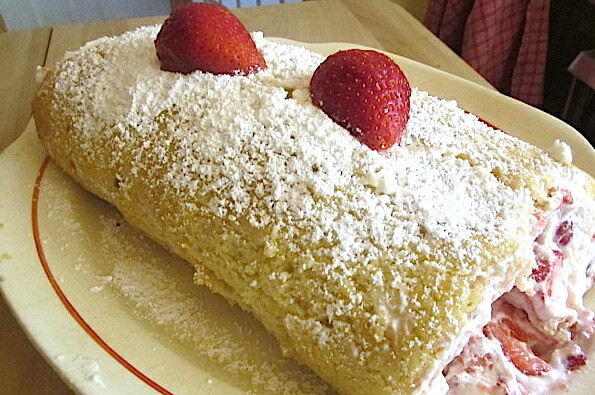 Unroll the cake, spread first with whipped cream, and then layer the strawberries. I used a LOT of strawberries and cream which made it hard to roll, but I wanted to fatten up my skinny child, so I didn’t care so much about the symmetry. Bake 12 to 15 minutes or until toothpick inserted in center comes out clean. Be careful not to over bake. You should still hear some sizzle…Immediately loosen cake from sides of pan and turn upside down onto towel generously sprinkled with powdered sugar. Carefully remove paper. 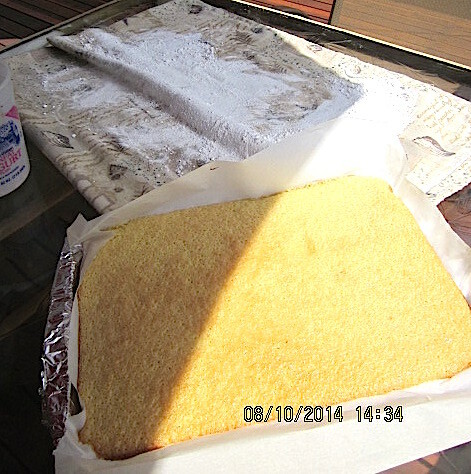 Trim off stiff edges of cake if necessary. 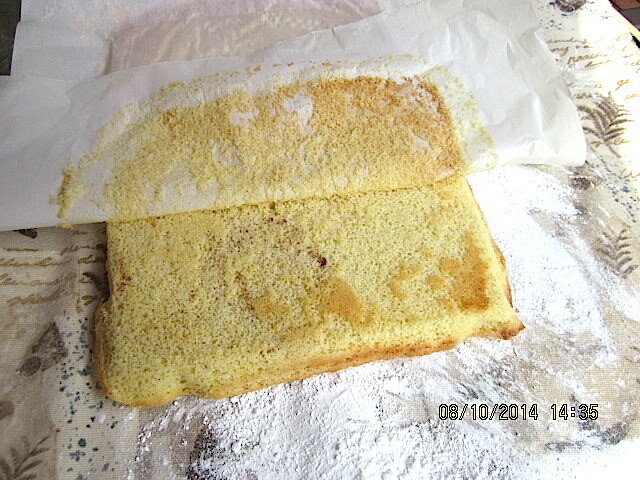 While cake ¡s hot, carefully roll cake and towel from narrow end. Cool on cooling rack at least 30 minutes. Beat one small container with 2 or 3 tablespoons sugar until stiff peaks form. 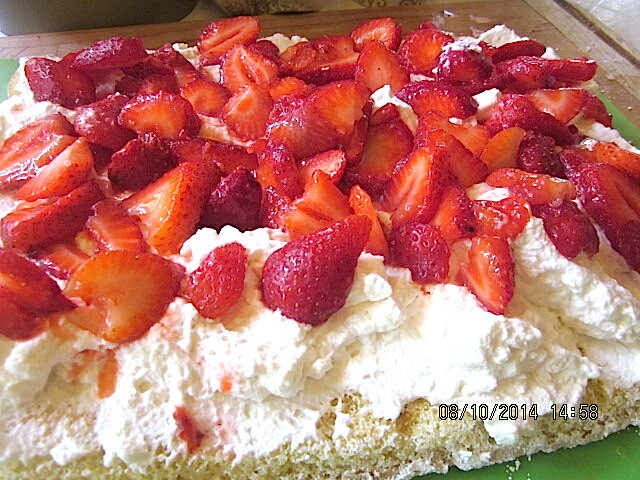 When cake is cool (hurry it up by placing in freezer for 1/2 hour) spread evenly with whipped cream and place sliced strawberries evenly over the unrolled cake. 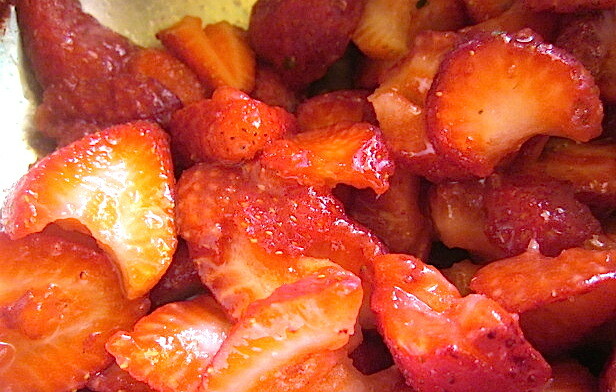 Roll up, sprinkle with powdered sugar, garnish with whole strawberries, and refrigerate. P.S. Try my very best Apple Pie Recipe. Click here. This entry was posted in All Posts, Being a Mom and Grandma, Recipes & Food, Mostly Vegan and tagged Apple pie, baking, Baking powder, Betty Crocker's Cookbook, Cake, Cake Roll, Casserole, Cream, empty nest, Flour, granulated sugar, Old-Fashioned Strawberry Cake Roll with Whipped Cream, parchment paper, Powdered sugar, Sheet pan, Strawberry, whipped cream by Enchanted Seashells by Princess Rosebud. Bookmark the permalink. If you had been in the area, I would have saved you a slice! YUM!!! You are such a brilliant baker!! Gosh, this looks amazing!! It is SO good and light, even with the whipped cream. A low cal version is prob what I’ll make for hub, not as decadent, but healthier for him. The only thing to remember is that even if it breaks, no worries, just slice it up or cover it all with frosting! It’s honestly not that difficult, just a bit of extra prep, but thank you! Now I have to figure out what to make for hub who arrives tomorrow night, and he does NOT need to gain weight lol! you’re always a lovely mum and wife ! And you always have lovely positive comments. Thank you! Wow, that looks good and glad your son had a chance to visit even though it was a short visit! He’s always on his way from one place to another, we’re lucky to see him at all! So sorry! It only lasted one day! hee hee, sorry! I guess it would be just as good totally vegan and I’m going to try it; but my son was craving exactly that, so of course… Next time you’re in our area, let me know, and I’ll make it for you! The tried and true and usually the best. Looks wonderful. You are correct, those old recipes (most of them!) are so good! Okay, now I want to come over and eat. Also, I love to bake too! Funny thing, that little post about the rolled cake caused my blog to go viral for a couple of days – way more than my what-I-hope-are-funny posts! Now you know I am going to try this! 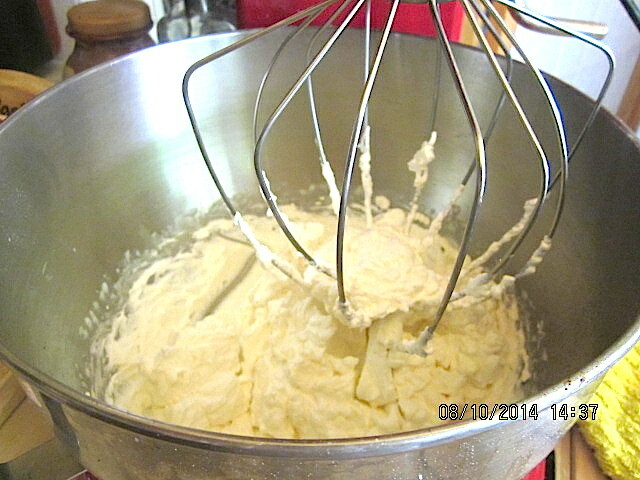 And a big “Amen!” to the homemade whipped cream! I’m sure it will be SO good, pics please! This does look amazing. Like I want to come live with you amazing. Well, when you’re in SoCal, come on over! You could make the cake and fill it with your favorite jelly or jam or ice cream works great too-it’s just as good with sweetened fruit, too! Wow, this looks wonderful! So yummy!